I know what you’re thinking: Baked brie? Have I lost my mind? Nope, better! 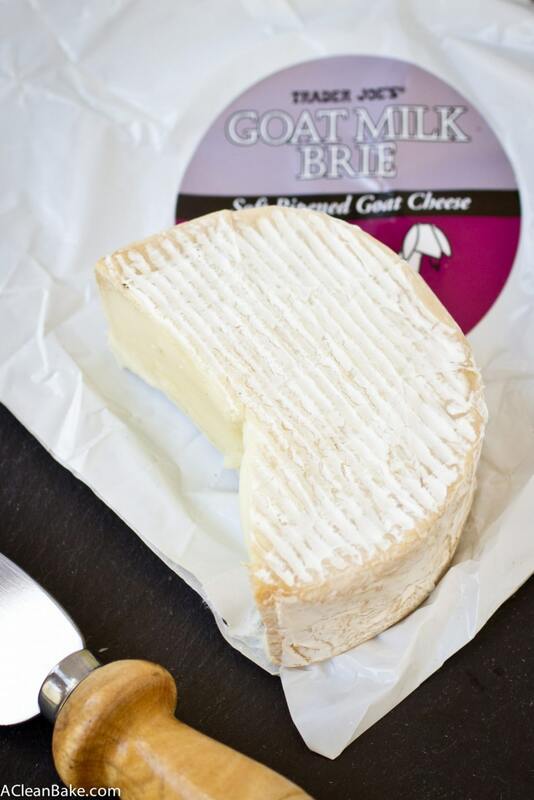 I’ve found – well not my mind, but that’s a whole other story – goat’s milk brie! Trader Joe’s has had it for awhile now, but I finally got around to trying it, and it was not only delicious, the lower lactose content of goat’s milk makes it much easier to digest if your stomach doesn’t typically play well with dairy. So, now that we’ve gotten that out of the way, let’s turn our attention to the humble yet extraordinarily delicious frittata. A frittata is a crustless quiche. You can certainly add a crust, and you can pretty much add one hundred other things. That’s the beauty of a quiche. For example, if I were more of a bacon person, I’d definitely add bacon, so please go to town on that one. I always use frittatas as a vegetable delivery vehicle. You get at least a serving, if not a couple, of veggies in your dinner without having to worry about making a whole other side dish (time-pressed dinner-cookers of the world: I feel your pain). If you’re not rolling around in quite the excess of beet greens that I am, no problem. 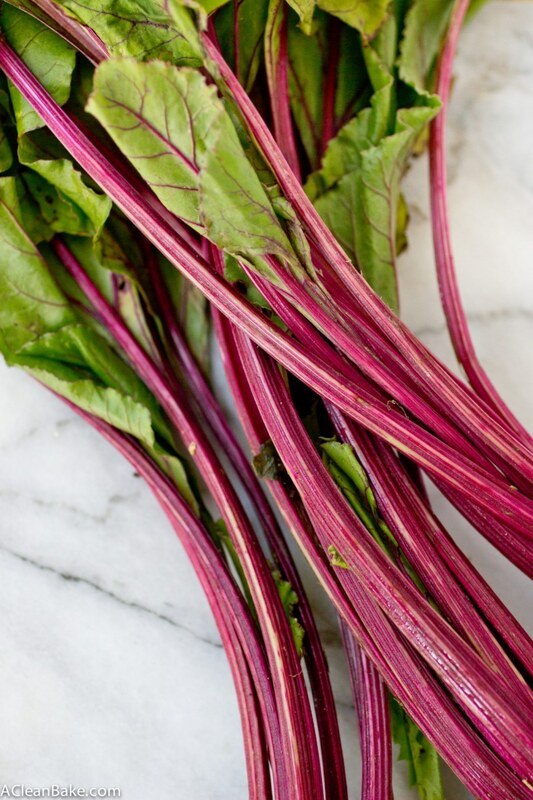 You can absolutely swap them out for something else, like Swiss or rainbow chard, kale (don’t include the stems) or any greens that come off of a root vegetable, like radish or turnip greens. Yes, you can eat them – I do it all the time. Just make sure that you wash the greens especially well. Root vegetable greens tend to be lousy with dirt and the last thing you want is a gritty frittata. Gross. As for the brie, well, I think that speaks for itself. If you’re not a cheese person, or not a stinky cheese person, you can skip it and this frittata will still be a great dish. If you’re more the bake-it-and-forget-it type, and don’t want to wait around for 10 minutes before adding the brie (but still want to include it), just add it before you put the whole thing in the oven, and expect that the slices sink down into the frittata and become gooey little pockets of cheesy surprise. Basically, I think that it is safe to say that the humble frittata is one of the most adaptable dishes out there, and best of all, this recipe should make enough for dinner to have leftovers for breakfast! Add the oil to a 10" oven-safe pan (cast iron is ideal). Use a pastry brush or paper towel to coat the bottom and inner sides of the pan before preheating the pan. When the oil is heated, saute the scallion and garlic over medium heat for about 2 minutes, until translucent and softened. Add the greens and increase the heat to high, and briefly stir to coat with olive oil. Add the lemon juice, salt, pepper and paprika, and stir to combine. Cook down for about 2 minutes, stirring intermittently, until the greens are limp and the stems are softened. Turn off the heat and spread the greens into an even layer across the bottom of the pan. Pour the beaten eggs over the greens and immediately (carefully!) transfer the pan to the oven. Bake for 10 minutes, until a crust forms on top of the frittata, then arrange the brie slices on top. Bake an additional 10 minutes until golden brown and firm. Store leftovers in an airtight container in the fridge for up to a week. This dish also freezes very well: try individually wrapping slices that you can then take out one at a time to defrost for future breakfasts. If you're on a Whole30 or dairy-free diet, you can make this without the brie. You may want increase the seasonings for extra flavor, though. Yield: 1x10" frittata; about 8 servings. 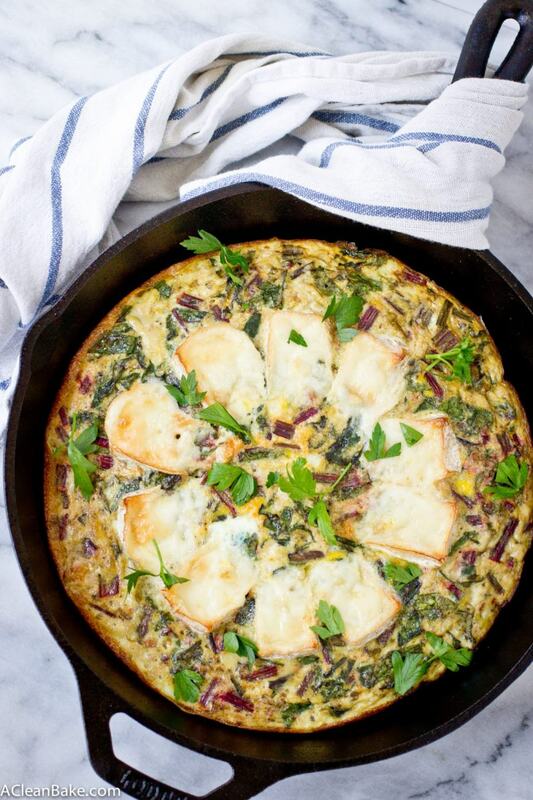 What an absolutely gorgeous frittata! I don’t even like brie, and you are making me want to try this!! This looks delicious! I love beet greens 🙂 Pinning! I saw this on your Instagram and was like OMG brie squares. Also, Trader Joe’s ftw! Yeah, I know, right!? It was an amazing find! TJs for the win! This is so beautiful! I love making frittatas with Brie (or just having Brie with accompaniments for dinner, which might be what my fiancé and I just finished doing…). Kicking myself because I just threw out some beet greens yesterday 🙁 I’ll have to try this after my next shopping trip! Thank you! I am so with you – I basically could eat brie on everything so no judgement at all! Yuuuhs! It goes without saying that this frittata is stuh-raight up my alley! I’m a big fan of the frittata + the beets + all things goat cheese. I’m not sure I’ve had goat brie before and now I’m itching to take a trip to TJ’s to check it out. So tasty, so fresh…I need this for breakfast eeee’ery dayum day! Have a great weekend, girl! Ahh it is such a good way to start (or end) the day!! I love frittatas! This looks delicious, I love all that gooey brie! Thanks, the gooeyness is the best part! Lol finding our minds is so overrated. I’d much rather find baked goat’s milk brie! 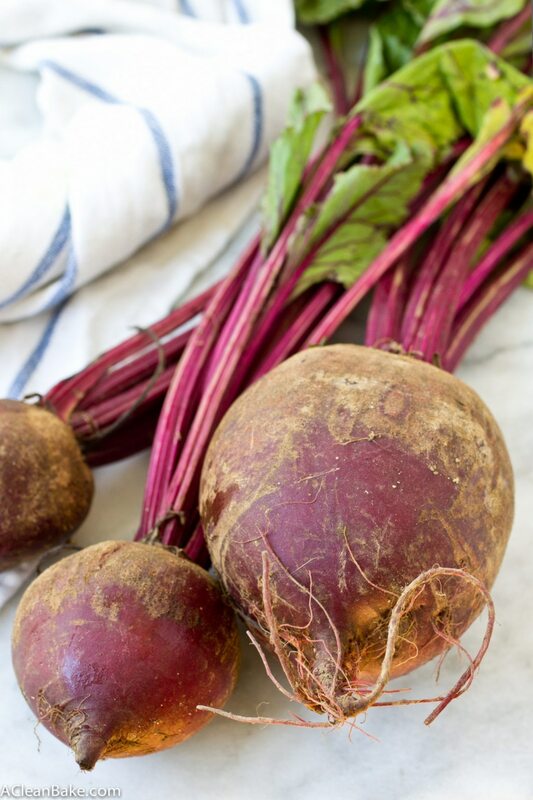 And whoa, beets? Showstoppa! I dig this app Nora, on so many levels! Oh my… love this, Nora. 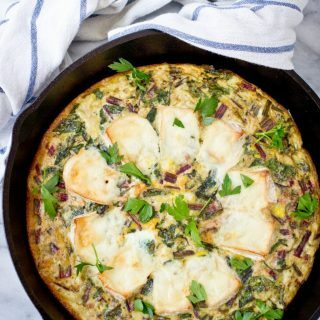 Frittatas make the best quick and easy week night meals and I absolutely love how you’ve paired it with beet greens and brie – I’ve not tried goat milk cheese, but you know it’s on the list now!! “Gooey little pockets of cheesy surprise!” LOL! I’ve been putting all my beet greens in my green smoothies lately, but no more! Next time I’ll hold them out for a frittata! Love this Nora! Thank you! Ooh I have never tried beet greens in a smoothie before! Don’t you love how versatile they are? I hope you get a chance to try goat’s milk brie, Traci! Thanks, Heather! I’ve been eating this for breakfast for a week, and I can attest to it being a great way to start the day! Honestly all I can say is this is stunning. Abosultely stunning !!!! I love frittatas!! This one is gorgeous – I would love to have a huge forkful of that melty brie and all of those greens right now! 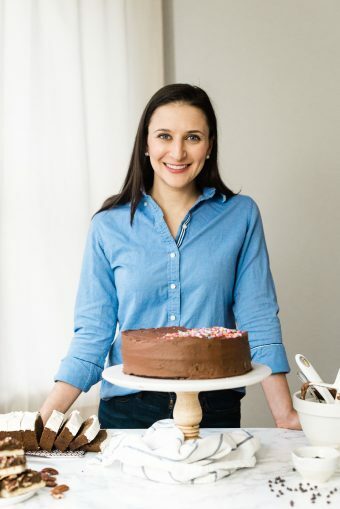 I’ve been looking for different dishes to add to weekend brunches and I think this would be a very welcoming addition! Gorgeous photos by the way! Thanks! After rigorous testing, I can say with the utmost certainty that this is a great dish for literally any meal 🙂 Happy brunching!